Mefix Self Adhesive Fabric Tape, provides a gentle means of holding a variety of wound dressings or medical implements to the skin. Mefix Bandage is used by medical professionals and individuals as an superb means of keeping something properly in place. 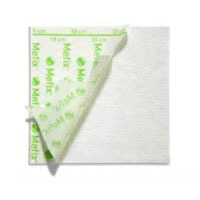 Mefix is a specific kind of cloth tape to use in a variety of different situations for affixing gauze, tubes, cannulas, and any kind of dressing material to aid skin healing or help accomplish a health procedure. This line of Molnlycke Tape is designed to make fitting, cutting, and conforming the material to the contours of the skin easy to do. The Mefix Self Adhesive Fabric Tape wound dressing is perforated to simply tear easily from the roll. Printing on the tape backing includes measuring marks to get the right size and shape. Mefix Dressing Tape is skin-friendly, water-based, and made from solvent-free polyacrylate adhesive for a fixation that is secure yet gentle on the skin. The material is soft, elastic, and non-absorbent while it is constructed on non-woven fabric. The nature of the material makes removing the tape very easy and practically painless. The fabric is non-woven for patient comfort. It is made from solvent-free polyacrylate adhesive. Mefix fabric is perforated to tear easily from the roll. The tape is skin friendly and is air and moisture permeable. It comes with centimeter marks to cut and shape appropriately. The Mefix Adhesive Tape is good for affixing gauze, tubes, cannulas, and various dressing materials.